As we all know, the combustion engine does not really convert the potential energy in fuel to kinetic energy to move the car efficiently. We lose alot of that power – roughly 76% – in the form of heat. BMW has tried to salvage some of this lost energy with their TurboSteamer system which harnesses heat from the exhaust flow and uses steam to power an expansion unit connected to the crankshaft. Someone in the engine business has another idea. Bruce Crower, the owner of Crower Cams and Equipment Company builds camshafts, crankshafts and connecting rods, including titanium rods for Formula 1 customers. He lets his company run itself while doing intensive R&D work in his 13-acre backyard in Jamul. 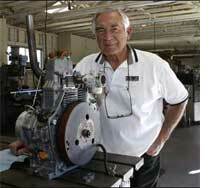 And his idea is a 6-stroke engine. He calls it the Crower cycle engine. The combustion engines we find in the modern automobile are Otto/Miller cycle 4-stroke units. Intake, compression, power and exhaust. What Crower has done is take an old single cylinder diesel powerplant, and converted it to use petrol. The previous diesel injection system was modified to inject water instead of diesel. Crower has added 2 strokes to the 4-stroke cycle. The 5th stroke is an intake stroke where water is injected into the really hot combustion chamber. The water is turned instantly into steam. Water expands about 1600 times when converted into steam gas, so that is the last stroke called the steam power stroke. An accidental benefit of the steam stroke is it effectively cools down the engine, eliminating the need for a radiator or other cooling systems. Crower says this would benefit large 18-wheeler trucks which have massive radiators that weigh about 450kg. Other benefits would be the possibility of increasing compression ratio to a higher ratio like 13:1 without the fear of engine pinging as the combustion chamber would be alot cooler. As a comparison, the 2006 Honda Civic’s 1.8 litre engine runs a 10.5:1 compression ratio. The result is a supposed 40% higher fuel efficiency for the 6-stroke Crower cycle engine as compared to the conventional 4-stroke combustion engine.